As we reopen for our third issue, Weave Magazine has had to make some changes to our submission guidelines regarding longer pieces of fiction and creative non-fiction. Here is a synopsis of the specific guidelines we have changed. - For both fiction and creative non-fiction, unsolicited submissions should be no longer than 1500 words. For pieces longer than 1500, please submit a query letter and include the title, word count and a basic synopsis of the piece. - For all submissions, please submit only ONCE during the reading period, unless otherwise requested by an editor. If you have already submitted fiction or non-fiction during this reading period, the first change does not apply at this point. Anyone submitting fiction after 12pm today must follow these new guidelines. If you have any questions, feel free to contact us at weavezine@gmail.com. Also in Arcadia by Andrew Mulvania is both a subtle and striking journey through childhood, loss and recognition set amidst the landscape of the Midwest. Mulvania, a native of Missouri, has written a collection of poems that pay homage to the people and places with keen eye for the small things that shape daily rural life. This work provides a glimpse into the past and holds its breath for the possibility of a more hopeful future. With a gentle, but wise voice that reflects awe and reverence for nature, rather than dominance or mastery, Mulvania shares the childhood lesson that life does not always provide the painless path. From there, Mulvania pulls back and focuses more on exhibiting child-like wonder at the world, yet maintaining the attention to detail required of any good artist. the hogs must all be loaded for slaughter. In the final section, Of Foreign Lands and People, Mulvnia pays formal homage to home, family and the great writers that have clearly shaped this writer’s voice. With detailed imagery, Mulvania eloquently invokes the spirits of Frost and Whitman, often using formal poetic forms and subtle rhyme. Just as the farmers painstakingly tend their fields, Mulvania has expertly crafted a collection of poems bright with imagery and rich in emotion. Also in Arcadia is a beautiful book that I highly recommend reading. In fact, Andrew is a featured reader at this month's Poetsburgh, Thursday, April 23rd at 8pm at Zany Umbrella's performance space in Lawrenceville. Come out and hear him read from Also in Arcadia and pick up a copy. Don't miss it! Andrew Mulvania is the author of Also In Arcadia, published by The Backwaters Press in 2008. His poems have appeared in an array of journals, including Poetry, North American Review, Bellingham Review, Green Mountains Review, and others. He was the recipient of a 2008 Pennsylvania Council on the Arts Individual Creative Artists Fellowship in Literature. He is currently an assistant professor of English at Washington & Jefferson College. Just a reminder to everyone that Weave Magazine is now officially open for submissions for issue 03, due out in October 2009. Please be sure to read over our submission guidelines; we often make updates to clarify any questions we receive via email. Also keep in mind that our release reading for Weave Magazine Issue 02 is Sunday, April 26 @ 6pm at Your Inner Vagabond in Lawrenceville, PA. We will feature readings from eight issue 02 contributors as well as complimentary beer and wine. We will have copies of issue 01 & 02 on sale and more information about Weave's workshops and the submission process. You can RSVP to the event on our Facebook page. We hope you can make it! Hi there, it's yer friendly neighborhood web-elf, bringing new spring graphics to Weave to celebrate the roll-out of Issue #2. I wanted to take a moment to thank the very lovely Hilde Vanstraelen of Belgium for her charming illustrations, seen in the new Weave banner graphic. You can visit her profile at Stock.Xchng here. You can visit me at daisybones.com and my art shop here. And, if you haven't picked up your Weave Issue #1, you can even find me there. In All Odd and Splendid, Hilda Raz makes everyday activities and objects assume sublime proportions. Breakfast, football games, and hospital visits all figure in the book as quotidian and spectacular, each with a biographical link to Raz. The collection moves with strategic focus in units separated by section. In early sections, Raz focuses inward, examining her relationship with her transgendered son Aaron Raz Link and the effects of his transition on Raz as a mother. Later in the collection, she looks beyond her family, memorializing a friend’s passing with introspection and sharp insight. What Raz might call insight, Aaron might call magic, as in one of the collection’s strongest poems, “He Graduates from Clown School:” “A lot of what I thought was magic/ is habit,” Aaron claims. In these poems, Raz inverts Aaron’s observation, revealing the magic she draws from her daily life as mother, friend, and writer. at bodywork, focused, intent, his eyes the color of stone. In this moment, the reader sees Aaron’s complex typography of recognizable forms, creating a soft/hard duality that defies simple binary opposition. Raz immediately turns this dualism onto herself as mother. “Her heart,” she writes, “a long-buried stone/ under her breastbone, beats out the pace lightly/ only for herself.” Here, Raz represents the simultaneity of joy and difficulty, motherhood’s signature. When Raz, in the book’s later sections, takes illness as her subject, the book’s scope shifts outward, encompassing a larger, unknown territory. “Do not go without us,” she implores in boldface to a dying friend in “Suite,” yet, the call goes unanswered: “… you go, cease,/ ceding yourself with your breath to us.” The frustration and loss accompanying death pervade this portion of All Odd and Splendid, and Raz examines her loss with exacting language, considering her own fate and elegizing friends. Thus, she never shirks from her subject, unafraid to look mortality square in the eye. Autobiography and universality, male and female, illness and health, magic and habit—the line between binaries blurs beautifully in All Odd and Splendid. Raz deftly crafts a world in this medium of contrast, using conventional and nonce verse forms to find the spaces between seeming opposites. The collection explores the vast, amorphous realms of death and gender with fresh particulars and a poet’s keen focus. All Odd and Splendid by Hilda Raz is published by Wesleyan University. Weave's editors have been busily preparing for spring which brings with it many reasons to celebrate! Here is a synopsis of all the literary happenings coming up with Weave. April brings National Poetry Month and we certainly will be celebrating in Pittsburgh. This week alone has so many events, so be sure to check out the Pittsburgh Poetry Calendar, or just check here weekly at the Weave Blog for updates each Sunday. More specifically, we are announcing the third installment of POETSBURGH, our collaborative reading series with Open Thread. It will be taking place Thursday, April 23 @ 8pm at the Zany Umbrella's Icehouse Artists' Studios in Lawrenceville. ALSO! 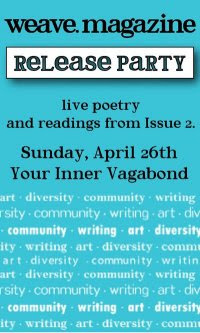 The Weave Magazine Issue 02 release reading is set for Sunday, April 26 beginning at 6pm at Your Inner Vagabond in Lawrenceville. We will feature at least five contributors from this issue - possible more! You can be sure you'll hear more about these two events in the coming weeks. Weave's Second Issue is almost here! Issue 02 of Weave Magazine is on its way to print this week! It will be available for purchase at the end of the month - we'll be sure to notify you with details. If you haven't checked out our list of contributors, you should. If your mouth is watering for another taste of Weave, then here is a delicious snack to feed your need: the contributor list also features sneak peeks of work by Karen J. Weyant, Brian R. Young, Rosanne Griffeth and Davka. Weave Blog Got it Going On! We continue to bring you weekly updates of poetry events happening around Pittsburgh. We are also striving to bring you more reviews of contemporary work, featuring reviews from other writers. Mid-April also marks Weave Magazine's 1st birthday and we certainly will have a lot to say about our first year as editors. Check back often or subscribe in the sidebar. Weave Reopens for Submissions April 15th! We have taken a break from reading since we got back from Chicago, and we really do miss having submissions waiting for us in our inbox. Please do consider purchasing a copy of issue 01 - or better yet, buy a subscription and you'll get both issues for the discounted price. Check out our submission guidelines for the most updated information.